The psychic world can be a little confusing if you’re new to it. Even those who are familiar can have trouble keeping up with important terms like psychic or medium. Contrary to belief, there is a distinct difference between the two, and we’re here to walk you through these differences. Psychics and mediums continue to be popular today because of the benefits they offer. They can bring individuals answers to questions they have or give them closure. If you’re considering scheduling a session with either one of them, it’s important you know how they differ, so you can go to the right one for your session. The role a medium plays is different than the one a psychic does, so which one do you choose? 3 What’s the Difference Between A Psychic and a Medium? 4 Which to Choose: Psychic or a Medium? What is a medium? We hear about them in the press, see them in movies all the time, and perhaps have friends and families who visit them every once in a while. Mediums will mainly help individuals communicate with the dead. They can tap into the afterlife and communicate with spirits. Perhaps there is something you forgot to say to a loved one. Or maybe you want to communicate with the other side to seek some answers. Most of the time, a medium will be able to deliver a message to someone who has passed. People who are grieving from a loved one’s death will normally seek mediums. Perhaps there is something they never told them, or they simply want to communicate with them one last time. Whatever the case, a medium works as a bridge between the physical world and the spiritual one. Commune with the Spirit World. Sometimes they receive messages to their brain, which they then share with the appropriate individual. This is a gift they are given that makes them vital to the psychic world. Perform Séances. The medium may try to establish a connection with the dead by performing a séance. These routines can be unsettling, so it’s important the person truly wants to communicate with the spirit. Some souls are very loud or have an urgent message and will reach out to the medium themselves. They will shout messages to their brains, which the mediummedium then communicates with the individual. Other times, these souls are very quiet, which requires a séance to take place. 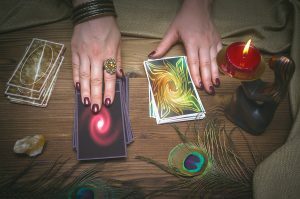 What is a psychic? Maybe the description of a medium ties very closely into what you believed was a psychic’s role. Both types of individuals hold special abilities that can benefit our lives. However, they differ in terms of what they can do for the living. Psychics also communicate with the spiritual world but in a different way. These individuals have been given abilities that allow them to establish communication with the living telepathically. Sometimes they receive visions of the future. They use these special abilities to advise their clients and mentor them on areas like love, money, or health. People are naturally drawn to psychics because their predictions are accurate most of the time. Not only this, but their heightened senses allow them to feel, smell, or see things that other people cannot. So how do they differ? Basically, a psychic can read into your future and offer guidance whereas a medium can communicate with the deceased. A medium uses their talents when someone wants to communicate with a loved one who has died. They can enter the spiritual world and deliver or receive messages with a spirit. A psychic, on the other hand, uses their abilities to give you insight into your future. They may conduct a Tarot card reading that reveals things about your life and future. Another large difference is how the world perceives both entities. Mediums, for instance, are more accepted and trusted because a large part of the world believes in the afterlife. Several religions practice this belief, so communicating with the afterlife isn’t so foreign. Many people believe this is a way to communicate with loved ones. Psychics, on the other hand, are not accepted as widely since there is no certainty that what they’re saying is true. 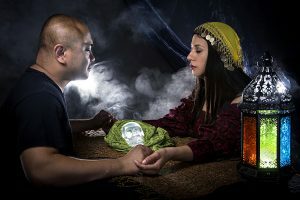 They read palms or lay out tarot cards on the table, which in many people’s eyes make them less credible since there is no absolute truth behind these methods. This is not to say that hundreds of people don’t seek their services every day. The information that a medium shares can be easier to verify as a dead person may share some specific information that only them and the individual know. When mediums share these personal, more private details, trust is built. Psychics cannot do this. It’s up to the individual seeking their services to believe in what they are saying. However, what they can offer is guidance about momentous events in your life. Which to Choose: Psychic or a Medium? Will you be better off with a medium or with a psychic? This depends on what you’re hoping to gain. If you want to reach out to a loved one who has passed, then you need a medium. They will be able to receive and send messages. If you are looking for life guidance and advice about your future, then you want to go with the psychic. Once you make your decision, you need to consider who you’re going with as well. There are a lot of scam artists who only want to take your money. They will feed you lies, and this could be a very devastating event. You need someone who is experienced, ethical, professional, with a strong intuitive nature. Word of mouth recommendations. This is most likely the best way to land a quality psychic. Don’t be afraid to ask a friend or relative if they know of any reputable options around. Online Reviews. Use the internet to your advantage. Look through reviews, photos, and give them a call if you want further information about their services. Price. More expensive options don’t always mean you’re getting a better reading. Readers’ prices depend on their experience and what they’re being asked to do. Are you being kept up at night with questions running through your mind? Are you uncertain about your future? If this happens to be the case, it may be time to consider the services of a medium or psychic. Doing so will give you the answers you’re looking for and help you be at peace with yourself. 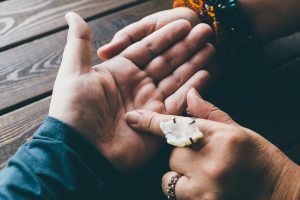 We hope this guide has helped you understand the difference between psychic and medium powers and how they can benefit your life. If you’re new to the spiritual world, welcome! We’d love to hear about your experiences.